I felt to post this article because my friend was trapped with BlackBerry phones, he used two BlackBerry phones in his life and shifted to Android phone. The best part of BlackBerry is that it allows users to take backup and restore all the contacts and the settings in such an easy way that users are addicted to the BlackBerry phones. But when your last BlackBerry phone is not working and you have a .ipd format file as a backup of your BlackBerry phone. To restore the file you don’t need to buy another BlackBerry phone, you can simply open the .ipd backup file with the help of MagicBerry. 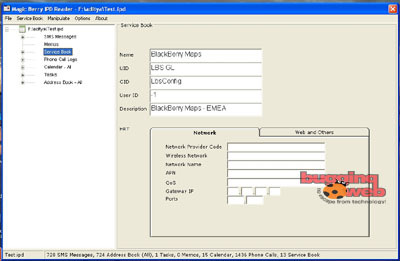 MagicBerry is free software to open BlackBerry .ipd format files. MagicBerry can open all the saved SMS, casino online Phone Call logs, Address book, Tasks, Calender, image and audio files. The tool helps us to export these files easily. To use MagicBerry you need to download the freeware and open the .ipd file by clicking File > Open and locate the .ipd file. It will extract all the saved details from the file. Please note this tool is still a beta version and new features are still under development. This software runs on mostly all the windows platform. Click here to download MagicBerry. It’s a good article, but if you are a Mac user? You haven’t mentioned what we can use, my case: I simply used Blackberry Backup Extractor app at blackberryconverter.com and believe me it worked, definitely recommend. Plus I saw that there is a Windows version too. This is my choice and I’m happy with it! Thanks Alexandra for your valuable comment! Ya I understand Blackberry backup app is very good as there is a cross platform support. But if you check with the Magicberry’s site, its still in a Beta version so they might come up with cross platform support and best part is that it is a free software. I like Magicberry for such reasons. Thanks Cyril for this post, I agree with you that we all like FREE gifts like MagicBerry. I am a happy windows user and greatly appreciate the time and efforts done to help the Blackberry community and I still looking to have more from MagicBerry. As they are in beta mode and on continuous development, I am convinced that they are going to develop a FREE Mac version. Yes John! the software works very well on windows platform and even I am waiting for the MAC version to be released. Thank you very much. My BB was drenched poolside this summer and I had no way of retrieving my info from the backup file. I did not get another BB I have crossed over to the Android world. You were a lifesaver along with your blog and post! I’ve been 28 days thinking my data was gone forever. Something told me to do some digging tonight and thankful I did. Thanks Nicole for your comment. I hope you retrieved all your contacts. Thanks visit again to get more of such articles! The good thing about the BB is that it stores backups, the bad thing is that if the .ipd file is generating an error, you are in trouble. Not to mention that it looks like BB’s were made for Windows as a base OS instead of focusing on all OS. Thanks for the comment and revisit again!